I only discovered John Burningham’s children’s books a couple off years ago, and I wondered why it had taken me so long to do so. The Financial Times describes Burningham as ‘one of the best writers in the business’, whilst the TES states that ‘the language of children is Burningham’s’. I wasn’t over impressed by ‘Mr Gumpy’s Outing’, but I nevertheless borrowed ‘Cloudland‘ from the library and was particularly glad that I did. 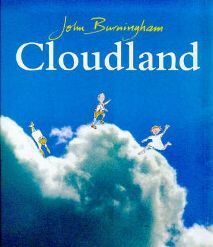 ‘Cloudland‘ appeared to be a tragic story at the outset. Albert, a young boy, is out walking in the mountains with his parents, and they are actually above the clouds. Albert’s father suddenly realises that it is beginning to get dark and urges his wife and son to hurry down whilst they can see where they are going. Poor Albert, however, almost immediately trips and falls off a cliff, leaving his parents feeling devastated. At this point I wondered whether this story would be just too tragic to read to young children, but then I found that Albert was safely caught by the children who live in the clouds. The central part of the book shows Albert having fun during the days he spends with the cloud children. Together they play jumping games, make thunderous noises, swim in the rain, paint rainbows and go racing in the wind. As much as Albert enjoys all these amazing activities, the time comes when he begins to feel homesick and the Queen of Cloudland hears him shouting ‘I WANT TO GO HOME.’ Will she be able to send him back to Earth to be reunited with his grief-stricken parents? Visually this is a stunning book, although I think it has to be said that many of the illustrations will be better appreciated by adults than by children. Well, why not, if it is adults who are reading the book? There are some double-page spreads with little or no text at all, where drawings of the characters are superimposed on breathtakingly beautiful photographs of mountains, sunset skies or storm clouds with pink-tinged edges. Children, however, will surely love the sketchy drawings of the cloud children holding out their hands to catch the falling Albert, banging drums and cymbals to create thunder and lightning, or jumping through billowing clouds. It is a wonderful book for allowing the imagination to run riot. The text is in a large clear font. Sometimes there are as few as three lines per page, sometimes there is a whole page of text broken into short, well-spaced paragraphs and perhaps including a small, black-and-white sketch. There is quite a bit of dialogue, which helps to bring the characters to life. This could be a suitable book for confident young readers to tackle independently, especially as the illustrations will prove attractive and give hints to the storyline. The only problem is that the people of Cloudland occasionally utter magic words such as ‘Hee ho goggle gralley fumble’, or ‘Teetum waggle bari se nee.’ These are wonderful-sounding phrases that usual result in fits of giggles when reading the story aloud, but they might not be so easy for a young child to try to read on their own. Adult help could be needed there. I have discovered some wonderful picture books for young children over the course of the past few months, but this has to be one of the very best in terms of both the originality of the story and the excellence of the illustrations. There is enjoyment to be had for the adult reader and the young child who is looking and listening; imaginations are stimulated in new directions. Don’t hesitate to invest in a copy if you have young children, or give it as a present that I’m sure will be treasured.